Here is a visual recipe for taco seasoning. 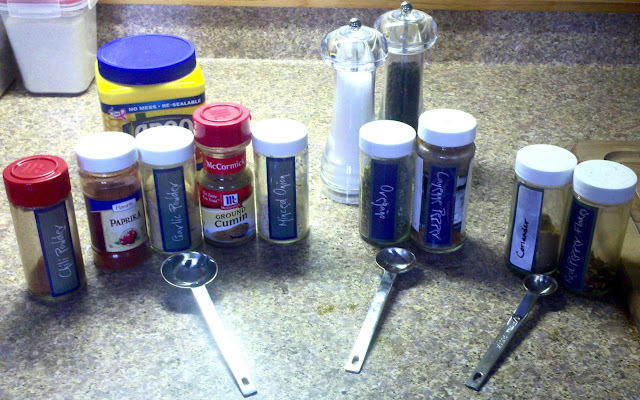 Use more of the spices on the left, less of the spices listed on the right. Use the most chili powder, about two tablespoons for one serving of tacos. Use about one tablespoon of onion (powder or flakes are both okay), and about a half-teaspoon of coriander and pepper flakes. Other spices scale on that spectrum; adjust to taste. Don't forget salt! It won't taste right without salt. Start with a couple teaspoons. Cumin is an essential flavor in this mix. Some people will want to add extra cumin. Add a tablespoon or so of corn starch to thicken the sauce. Mix up a lot of taco seasoning, save it for the future, and you'll have it whenever you want tacos.